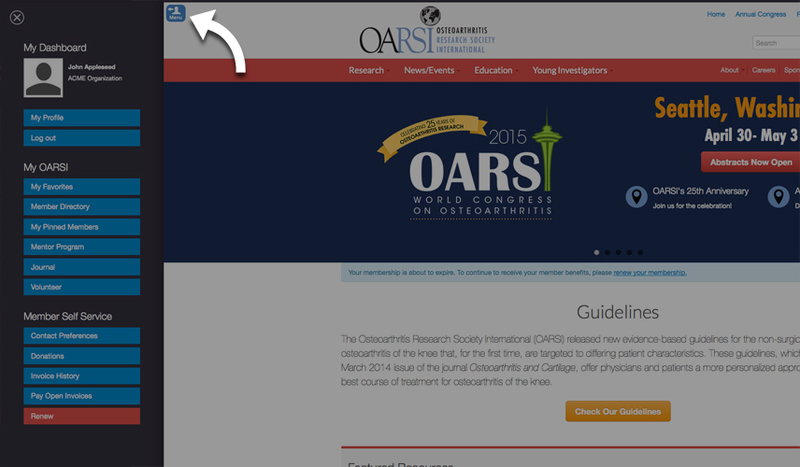 Enter your Osteoarthritis Research Society International username. We're sorry, but you may not access this area without logging in. If you already have an account, please login using the form to the left. If you do not have an account, you can create an account to access this area. To renew your dues or update your profile, click the blue menu icon in the top left of the page after logging in. To signup for our e-newsletter, please create an account. If you already have an account or are a Member of OARSI, you are already signed up to receive our e-newsletter. OARSI is professionally managed by Association Headquarters, a chartered accredited association management company. Copyright © 2013 Osteoarthritis Research Society International. All Rights Reserved.